Getting data from one place to another is by no means tough, but there are many drawbacks to the currently available popular solutions. 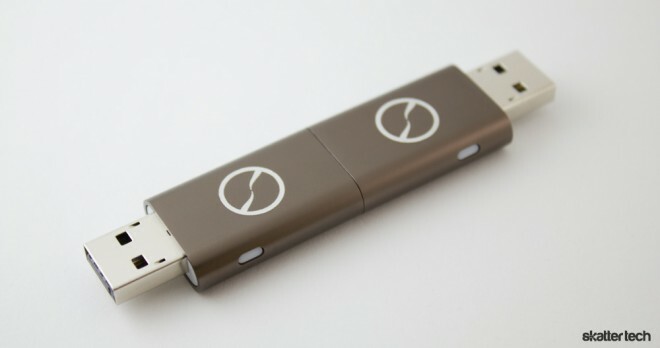 For instance, flash drives could end up in the wrong hands when lost and these come with a fixed amounts of storage. Cloud services are another option, however these often have associated monthly fees and the risk of security vulnerabilities are not uncommon. iTwin hopes to solve this problem with a little gizmo for Windows machines which enables secure and unlimited computer-to-computer file transfers. The concept behind iTwin is quite simple. The little gizmo breaks into two halves with each end going into separate machines. For those wondering, it does not matter if the local computer and the remote computer are on the same network or across the world. Once iTwin establishes a connection between both, users can securely transfer files between each machine. Transfer speeds are only held back by the upload and download network capabilities of the local and remote computer, respectively. Since iTwin directly ties into the Windows operating system, users can take advantage of the entire storage capacity of a computer’s hard drive or even external drives. I was quite impressed with the ease of configuration. After plugging the iTwin with both halves joined together into my Windows 7 laptop, I had to install a little program contained on the device. Although I was expecting a portable app, the application actually installs to and remains on your hard drive. Fortunately, it has a fairly small footprint and is easy to remove. Next, I snapped off one half and plugged it into another computer. I had to repeat the installation process, which takes less than a minute, here as well. For those wondering, this is not Wireless USB technology. iTwin merely takes advantage of your internet connection and establishes a link between two different computers for file transfers. The device supports Windows XP and Vista too. Mac OS users are left in the dark for now, but iTwin claims to offer compatibility soon. I was quite glad to find that iTwin takes advantage of Windows Explorer through a shortcut in “My Computer” rather than going with a custom interface. 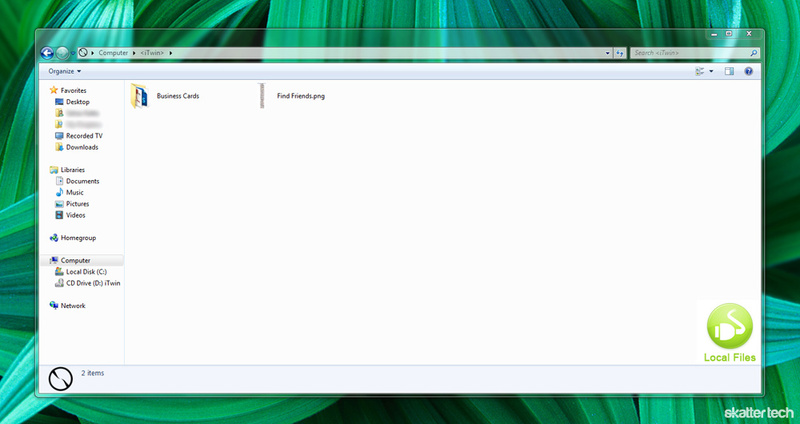 Dragging files or folders into the local window makes those items available to the remote window. Unlike Dropbox, iTwin does not pre-fetch data instantaneously. Icons for available items appear in Windows Explorer on the remote machine, but users will have to wait for files to transfer over each time they attempt to access one or more. I found that transferring files over a local network is quite snappy. A 700 MB video file took just a few minutes to copy over WiFi. I tried this test again from a remote location and although the transfer speed was slower, it still worked like a charm. Users will be glad to find that it is possible to open, edit, and save documents on a remote computer directly from the iTwin folder too. This is especially great since the technology eliminates the need for creating multiple files. With that being said, I should note that iTwin is best suited for a single person. Having two people adding and removing files on both ends will not end well since overrides are inevitable. Just when I started to enjoy iTwin, I realized I need to leave the local machine on at all times. Setting aside the obvious fact that keeping a computer running is a huge waste of energy, the remote machine can not access any files if the local machine falls asleep. I hope to see a newer version take advantage of Wake-on-LAN to make it possible for iTwin to wake up the computer when needed. Remote access tools such as LogMeIn can already wake up a sleeping computer remotely. Over the past few months, even some of the largest companies have had to deal with hackers leaking stolen data including personal information of customers to the masses. This situation has drawn heavy criticism to popular cloud services. iTwin fortunately circumvents this entire issue since their technology does not store any information online. 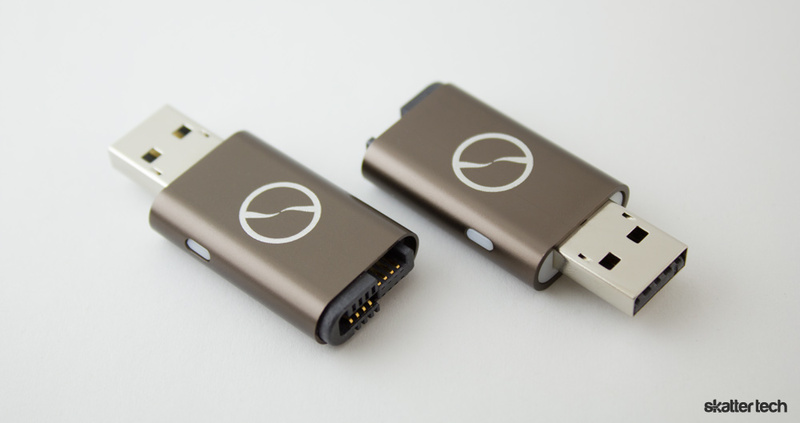 The separable physical USB components are essentially security keys — it is not possible to access data without one of these. In fact, iTwin servers only help establish a link between the two pieces. Data transactions occur directly between the two computers. Did I mention encryption? During the initial configuration, iTwin generates a unique key for each half. Using that token, all file transfers take advantage of AES-256 to prevent others from viewing your information. iTwin also prompts users for an email address during setup and sends them a unique code. The company’s website offers a page to key that in from any browser to disable the connection between the two ends in the event that one piece is lost or stolen. Users who are still paranoid can configure an additional password for an extra layer of security. If you were to lose the remote piece, unplugging the local piece would also prevent anyone from access your files. iTwin offers replacement halves on their website too. According to documentation, users can apparently reactivate both pieces of iTwin even once disabled by plugging both parts back together and connecting it to a computer when found. While larger corporations take advantage of VPNs, the costs are expensive and getting setup is difficult. iTwin takes care of all the complications — buyers do not even have to deal with port forwarding even when behind a firewall for that matter. Another bonus? There are no monthly costs. Cloud services such as Box.net or Dropbox offer a few gigabytes of storage for free and charge for additional space. iTwin has no bandwidth or storage limitations aside from the capabilities of your network and computer, respectively. I am confident many would agree that having a secure encrypted direct connection between two computers is safer than having to rely on a third-party too. With that being said, there are some concerns worth noting. If iTwin’s servers go down or the company does not stick around, this device becomes useless. However, keep in mind that the same logic applies to cloud services too. Going with a flash drive may sound affordable, but finding a secure one with hardware encryption such as the IronKey we reviewed is just as expensive. iTwin is definitely a great investment for business users who need to have secure remote access to a large selection of sensitive files and would prefer not having to carry a copy with them to avoid a the risk of loss. This device is already available for a one-time retail price of $99 and those who shop around can probably find it for less.